On Thursday the 18th of January, trading on the EURUSD pair closed up. The pair started rising during the Asian session and gathered pace during trading in Europe. This rise was initially interpreted by traders as correcting the drop from 1.2288 to 1.2165. After taking 1.2220 (45 degrees), growth on the pair sped up to reach 1.2265. Traders sold off the dollar in anticipation of a potential government shutdown as well as due to the publication of mixed US data. Growth in the number of housing starts in the US slowed down in December, while the Philly Fed manufacturing index came out lower than expected. It was later revealed that Republican lawmakers voted to extend government funding to the 16th of February, so fears of a government shutdown have been put to rest for the time being. My expectations for Thursday of a rebound from the 45th and 67th degrees didn’t come to pass. The mixed US statistics as well as fears of a government shutdown helped buyers recover 85% of the drop from 1.2288 to 1.2165 if we include today’s Asian session. The fundamentals turned out stronger than the technicals. 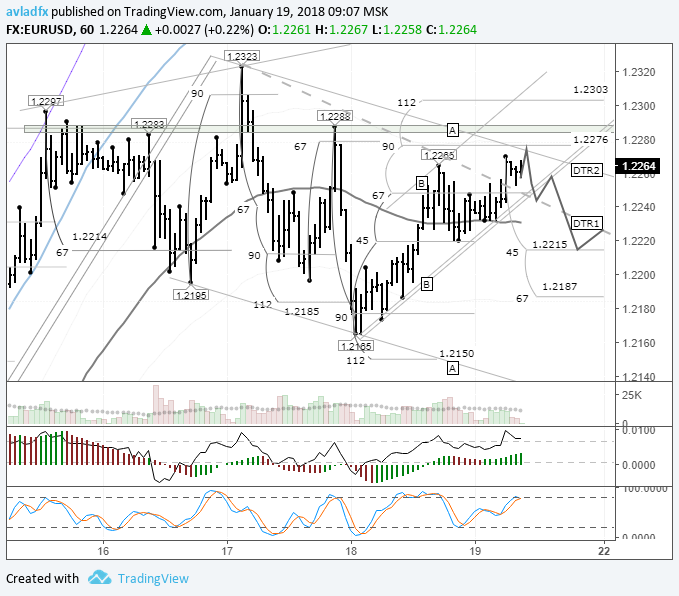 Upon reaching 1.2265, the price technically rebounded from the DTR1 trend line, but met with some resistance during its decline at the LB balance line at 1.2220. Buyers successfully defended this level and today, in Asia, the euro has renewed yesterday’s high of 1.2270. The euro appreciated on the back of a declining dollar, supported by the crosses. I’ve adjusted the DTR1 line a few times after some false breakouts, but now that it’s actually been broken through, I’m turning my attention towards DTR2. I lost sight of the A-A channel yesterday. It’s formed from three values: L 1.2195, L 1.2165, and H 1.2323. We need this channel to help us see up to which level we could see quotes rise in the event of a breakout of the DTR1 line. On the current bar, it runs through 1.2275. The prospect of a US government shutdown has been sidelined for the time being. US 10Y bond yields are rising every day. Considering that I have two open short positions on the euro from the 45th and 67th degrees, I’m going to keep waiting for the pair to break down the lower boundary of the B-B channel. I may be wrong, but my pricing model on the hourly chart doesn’t look promising for the euro’s growth prospects. The euro is being propped up by the crosses, which is why we haven’t seen a decline on our main pair.